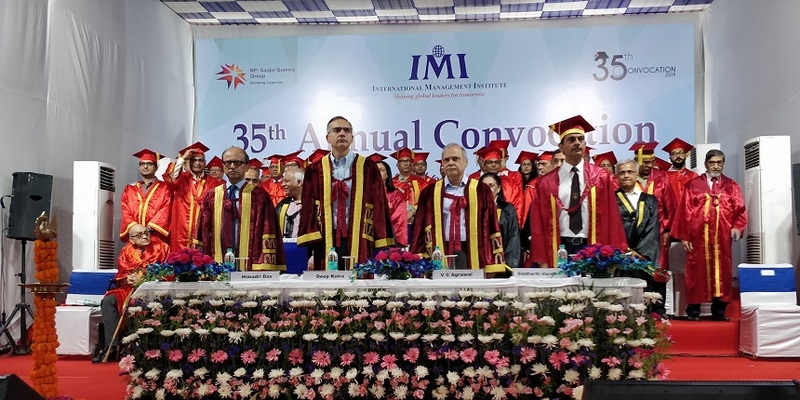 NEW DELHI, APRIL 17: 349 students of the International Management Institute (IMI), New Delhi were awarded diplomas during the 35th Annual Convocation Ceremony. 225 students from the PGDM program, 36 students from the PGDM-HRM program, 53 students from PGDM (B&FS) program, 32 students from the PGDM (Ex-PGDM) Program, and 3 students from the FPM program received their diplomas. The proud families of the graduating students, having made the trip to IMI New Delhi to capture the happy moment, kept cheering the students. Speaking on the occasion, Dr. Himadri Das, Director General , IMI New Delhi said, “I would like to heartily congratulate all the students on this occasion. I would really urge you to build a CV of your achievements and not a list of job and salary numbers. Aim to make a name. Above everything, try to become a good human being. You don’t need an ethics course to learn this. Humility will help you to earn respect. All of us at this institute are of firm belief that our students will play a critical role in guiding our country through to an innovative and exciting future. With this conviction in our hearts, I wish you all the best! Chief Guest, Deep Kalra, Founder and Group CEO of MakeMyTrip encouraged the graduating students to embrace failure and learn to be calm in crisis. Listing some of the achievements of the institute, Director General talked about introduction of a special medal for MBA students who publish a research paper in a peer-reviewed journal that is indexed in either the Scopus or Web or Science global databases. In most Business schools, it is the doctoral students who publish research papers. This initiative will make IMI, New Delhi possibly the only Business school in the country which recognizes and awards MBA students to publish research papers. Finally, in an attempt to bridge the gap between theory and pragmatics of Management studies and practices, IMI, New Delhi is currently in the process of a major curriculum restructuring exercise. This is being done in consultation with a high powered Industry Advisory Council consisting of CXO level executives from across different industry sectors. Astride of these initiatives, the institute further underscores its commitment towards imparting top-class education to its students, thus aiding them to become the future thought leaders of society.